Waiting on Wednesday is hosted by Breaking the Spine and is meant to showcase upcoming books that you can't wait to read. Discover how Lauren Kate transformed the feeling of that one mean girl getting under her skin into her first novel, how Lauren Oliver learned to celebrate ambiguity in her classmates and in herself, and how R.L. Stine turned being the “funny guy” into the best defense against the bullies in his class. 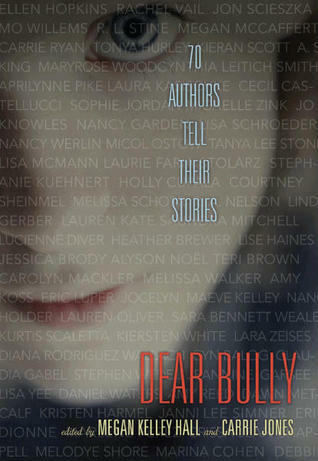 Today’s top authors for teens come together to share their stories about bullying—as silent observers on the sidelines of high school, as victims, and as perpetrators—in a collection at turns moving and self-effacing, but always deeply personal. This is one of those books I wish would have been published a couple weeks earlier, either that or I had been able to get an ARC of because I was hoping to have it finished before the start of the school year. I really want to find a way to incorporate this book into my literature and English classes. I'm already imagining how I can use this book along with the picture book One by Kathryn Otoshi in order to address the bullying problem that seems to be so rampant in schools today. This sounds SO good! I'm a sophomore English teachers and we've already talked about bullying this year. I would love to read one of these shorts out to them. What grade do you teach? Jenna, I teach 6th grade. What a great and timely topic! I hope you enjoy this one....and thanks for sharing. I love, love the idea of this. It's going to be such a powerful read. Excellent pick!!! Hope you all enjoy this book. It was amazing to put together. You can't help but be moved by these stories. They will make you laugh and cry and have the undeniable urge to put an end to bullying....right NOW!